In Hyperdimension Neptunia, Neptunia is based on Sega Neptune. The name of her country, Planeptune is obviously a reference to Sega Neptune. My question is, what console the other CPU and CPU Candidates (Nepgear, Noire, Uni, and Vert) are based on? Noire means black and her country is Lastation which is based on Sony Playstation. But, PS2, PS3, and PS4 all has black color. PSX/PSOne is excluded since it's gray. Which Playstation console is she based on? The same can be said about Vert, which means green. There are several variations of XBox. Which one is she based on? And what about Nepgear and Uni? EDIT: Considering that Blanc's sister are Rom and Ram, which is obviously a reference to ROM (Read-Only Memory) and RAM (Random Access Memory), it might be possible that Nepgear and Uni refers to a certain peripheral/component/parts of the console. But still, what part? Noire does represent the PlayStation as "Noire" means "Black" in French, the default color of PS2, PS3, PSP and PSVita. Her HDD form in Neptunia Victory is based on the original PlayStation, her human forms seems to be based on PlayStation 2, and the yellow diamond on her outfit being a variation of the Sony Computer Entertainment logo (seen upon booting up PlayStations). 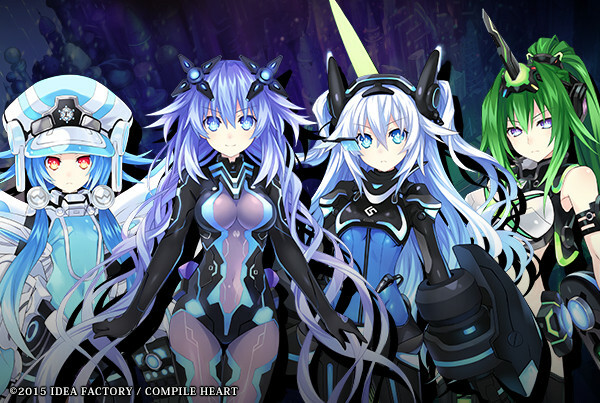 In Neptunia Victory, all of her Processor Units are based on PS consoles: Her default (Stone Gray) is based on the original PlayStation, Night Blue is based on the PlayStation 2, DX Silver is based on the PlayStation 3 prototype, Piano Black is based on the PlayStation 3 and Orbital-S is based on the PlayStation 4. Uni is based on the PlayStation Portable, probably with her name derived from the PSP's optimal disc, the Universal Media Disc. Vert and Leanbox references the Xbox and Xbox 360, but there is no concrete hint to which they are. Although, in the first game, Vert was said to have a problem with getting too hot; this may reference the 360's tendency to overheat. The Green Heart's outfit is revealing, preferably to easier vent heat. Ram and Rom are both based on the Nintendo DS. As they are twins, they could resemble the DS' dual screen. The rectangles on their hats in their default outfit seems to represent the screen icons from the DS logo. Each game in the Hyperdimension Neptunia series is different. They have different stories and different origins. As an example, in Re;Birth 1, the remake of the first game, the goddesses were fighting against each other in the start of the story. In Re;Birth 2, they were already friends in the beginning and Arfoire is technically dead. With that in mind, when the first game was conceived, the latest consoles are the PS3, the Wii, and the Xbox 360. Noire, Blanc, and Vert's CPU forms represents these consoles respectively. The color scheme for Noire and the PS3 is black. For Blanc, it's white and blue just like the Wii. For Vert, it's green and white, just like the Xbox 360. By the time the second game (Hyperdimension Neptunia MK2) comes out, the PSP and the Nintendo DS are already released. Ram and Rom represents the dual screen that the DS has and Uni represents the PSP. You can see how the front of Uni's dress matches the UMD holder of the PSP. Her color is also black, which matches the piano black color scheme of the PSP. Although the goddesses represents the entire console line, their style changes with each generation as each game are different. With Victory 2, because the new Xbox One is the latest Xbox console, Vert's color theme changes to include black. Noire's color theme also includes blue due to the bluish color that the PS4 have. Neptune is based on the Neptune in name only, much as Nepgear is not directly based on the Game Gear. The Neptune and Nepgear they are named after are fictional seventh gen devices. They can be seen in the media related to the games and occasionally in the games themselves. Not the answer you're looking for? Browse other questions tagged hyperdimension-neptunia or ask your own question. What was the terrible artwork on the flyer in episode 1? What anime is this blonde girl wearing a purple dress from? Is there any correlation between the CPU and CPU candidates' oppai sizes like there is with KanColle? In what order do the Hyperdimension Neptunia games go (including the animation)? What is the connection between Cave being nimble and nothing being able to touch her “hitbox”? Why does Neptune give Broccoli the nickname Puchiko? What is this Doc Tear Popper MAGES is looking for?